The Europeans have this amazing thing where they get something like six weeks of paid vacation, which of course sounds astronomical to the average American ear! This is a custom we really ought to try to adopt in the United States! Where is everyone going on his/her holiday? Well, it seems like most do a domestic trip (either up to the Disko Bay area (Ilulissat) or to South Greenland) and at least one international trip. It seems that everyone goes back to Denmark to see family and friends, to go to their summer home, etc. and then some also do a longer-haul trip. It is a little curious to me, though, why people would go away from Greenland in the summertime – a time when it is so beautiful here! Yes, the snow and winter can be very beautiful as well, but one would think residents would want to stay to experience some of the warmer weather! The warm season is only but so long, and to spend almost half of it away seems counter-intuitive. Why leave it? Why not take holiday in the wintertime to escape the cold and darkness a little bit? But maybe that is just my biased perspective of a newcomer who wants to make the most of every minute in Greenland – for Greenlanders it probably just feels like same old same old after a while… this is mundane for them; summer will still be here when they get back, and the next year, and the year after that. Speaking of holidays, practically everyone in my immediate life here is going on holiday in the next month, leaving me feeling quite stranded here in Greenland! I should preface this by saying that I, too, am getting to go on a trip – I would call it a holiday because I am getting the amazing opportunity to see another part of Greenland, but truth be told, I will be working the whole time! I will be going to the Disko Bay area to help film a food-travel television documentary as well as to conduct visitor interviews – two nights in Ilulissat, followed by two nights in Uummannaq, then one night each at Eqi Ice Camp and Rode Bay, then ending with five nights back in Ilulissat! I am so excited for this trip but it is a little bittersweet, also, what with all the holiday departures. Look out for my next blog posts – they’ll be from beautiful Disko Bay! Nanook played until close to kl 01.30, at which point we moved from Manhattan Nightclub over to the Bryghus until closing time at 03.00. There was a three-piece band singing American cover songs like Jason Mraz “I’m Yours”, so we switched back and forth between dancing on the dance floor and hanging out in our booth. When we left at 3 in the morning, the sun had just risen less than ten minutes earlier. So, we never saw nighttime on this night because we went in an hour before sunset and came out a few minutes after sunrise! It is definitely something that takes time getting used to, this 21 hours of daylight in the summer thing, but it is nice. I feel like it is good for one’s mood when everything is filled with sunshine! I can’t imagine how Springtime must feel for Greenlanders after a winter’s worth of darkness! I must say, though, that having a social life in Nuuk comes with a hefty price tag! One round of drinks for the four of us (3 beers and a rum & coke) was 220 DKK = $37, and then afterward a 40 cl beer (13.5 oz.) was 75 DKK = $13! Not to mention the price of the ticket (125 DKK = $21, which was definitely worth the money), coat check (30 DKK = $5), and round-trip cab fare to go about 6 miles total (105 DKK = $18)! A girl that Sharon and I met last weekend, Ivalu, told us that in Nuuk people usually don’t go out until well after midnight because it is so expensive to buy drinks at a bar – now we see what she means! But in any case, it was great to finally experience the night scene in Nuuk! On Friday, my coworker, Jesper, invited me to go on a hiking/camping trip with him and a few friends. I, of course, accepted because I have been itching to get out on the mountains, and going with locals is the best way to do it! 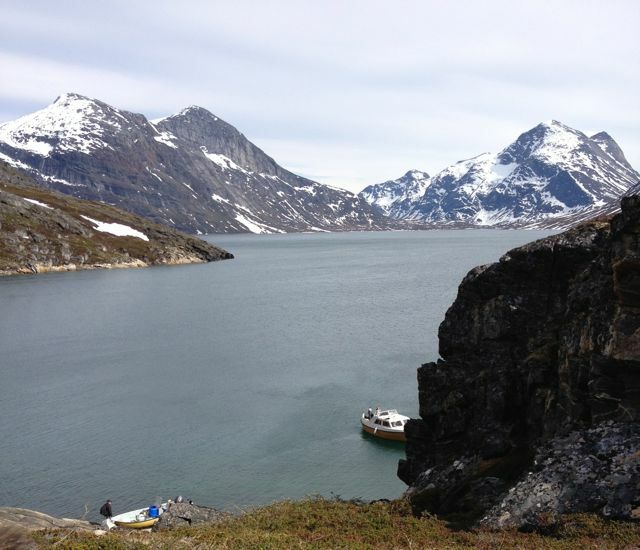 We met at the harbor and sailed about 30 minutes south to a place called Uppik, a small little inlet a few fjords over. It was actually very close to where I sailed last weekend in Kobbefjord. 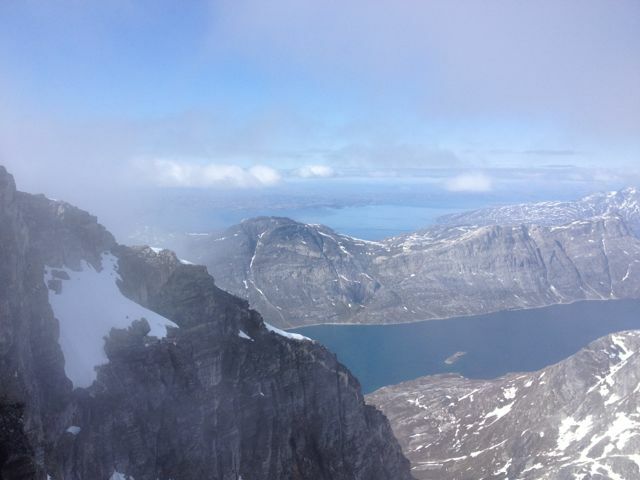 The mountain we were to hike, Kingittorsuaq, looks over the mouth of Kobbefjord. We had to sail to the backside of the mountain, though, because the water in the fjord was too deep to drop an anchor. After unpacking the boat, setting up camp, and preparing a bit of lunch, we set out on our way at approximately 11.45. After maybe fifteen minutes, we came to a small stream and debated all the paths to cross it. Everyone decided to take off boots and jsut cross the river barefoot. The water was crisp and cold, but it was not unbearable. About half of the mountain was a mix of mossy, small-brush cover (some of which was still covered with snow patches) and then the top half was much rockier, with the very top actually more like boulders. The summit elevation is 1.184 meters (3,885 feet), and there is a faux summit, of sorts; when you get to what you think is the summit, you see that actually you have to hike down a little bit and then back up to the true summit. We actually only made it to about 1.160 meters because there was still quite a bit of snow at the top, and we did not have poles. 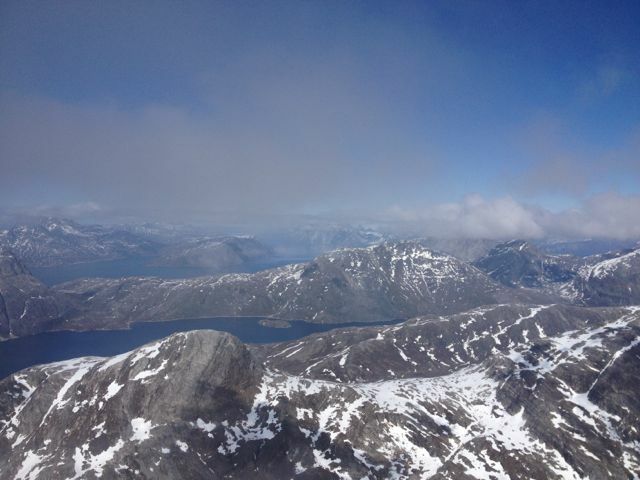 Here are pictures from our highest point. In total, the hike up and back down was 7.5 hours. Not bad! We promptly made a fire and cooked up our meats, chatted a bit around the fire, and made hearth bread. In the morning we took our time to enjoy the big sky and eat breakfast before packing up and sailing back to town. It was a great trip filled with lots of beauty and some physical challenge, and I was so thankful to Jesper for inviting me! Sharon and I saw Men in Black 3D yesterday at Katuaq! On the walk home we said that while we did not think we would be living a primitive lifestyle here, we definitely did not imagine that an average afternoon would include casually seeing a 3D movie! To be honest, life has been downright normal here! Again, I did not think I would be stepping back in time or anything, but I did think I would have to make at least a few serious lifestyle adjustments. So far the only thing that has really taken getting used to is not being able to pick up my iPhone at any time to make a phone call or send a text message. I mean, technically I could by a local SIM card here and get all those luxuries, but I think life is probably better without the 24/7 connectivity. But not to worry, if I am feeling “disconnected” I can always pick up my Mac Book Pro and get on the internet to g.chat and send emails 🙂 I can even Skype or FaceTime every once in a while! I will say that I think this feeling of normalcy is accentuated by living with Pia & Ulrik & Aviaja who live a very European lifestyle (in my opinion) and also by working at a company where all the employees but one are European. I think my experience would not have been the same if I had lived in a Danish-Greenlandic household, or even a completely Greenlandic household. But maybe I am wrong to attribute it to the ethnicity. Maybe it is more about WHERE I live and work rather than WITH WHOM I live and work… but then again maybe those themselves are related to ethnicity… I have not figured that out yet. I can say with certainty that Nuuk is a very curious city. I have only been here eleven days now, but if I had to choose one word to describe everything so far, it would be MIXTURE. This can be seen in the lifestyle of being surrounded by the latest Apple gadgets and nice furnishings while still going out to hunt and fish so that you have a season’s worth protein supply. And less than half the roads in the entire country (which do not connect any towns or settlements to each other, by the way) are paved. This can be seen in the people – a lot of the children here are first generation Danish-Greenlandic mix. The children can range anywhere from still looking very Inuit with dark hair, dark eyes, and round faces to being blonde or red-headed with blue eyes and freckles. I would say that it is more common to see a Dane married to a Greenlander than it is to see a Dane married to a Dane or a Greenlander married to a Greenlander! Yesterday and today were great days! After work yesterday, Sharon and I walked around the Colonial Harbor area which is right by our office on Hans Egedesvej (the road name). 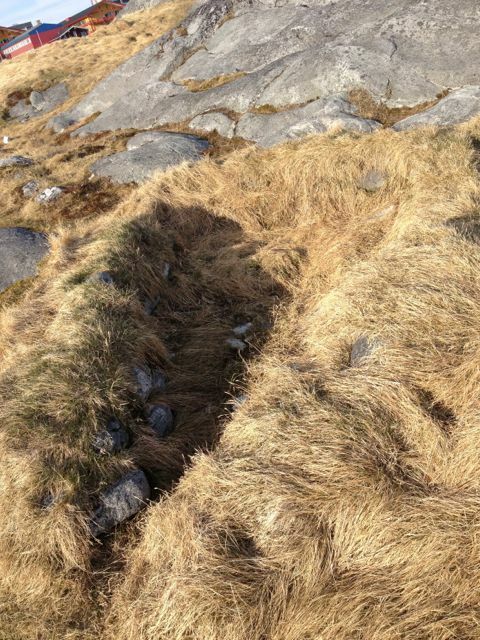 We also climbed up a small hill to the status of Hans Egede, founder of Godthåb/Nuuk in the early 1700’s. From there, there was a beautiful panoramic view of the water and the city! Then we went to the grocery store to pick up some food to cook for dinner at her apartment in Nussuaq. We ended up with seasoned ox burgers (which I think is actually beef, but they call it ox, not to be confused with musk ox, which is an entirely different beast! ), frozen vegetables, baguette, stinky cheese, and pate! We had hoped to buy some red wine to pair with our burgers but we learned the hard way that in Nuuk they stop selling alcohol at 18.00, and then it is not possible to buy it until Monday morning, so if you do not have your supply by Friday afternoon, you are out of luck! It was not to worry, however, because Roar, with whom Sharon is staying for her home stay accommodations, had plenty of wine in the pantry! It was actually pretty warm out (maybe 55*F), so we sat out on their balcony and drank wine and ate bread, cheese, and pate! While Sharon and I wore long pants and sleeves to feel comfortable, Roar was actually in shorts and a t-shirt! I hypothesize that how cold one feels and his choice of clothing is all relative! In Greenland, these temperatures are on the warm side of the scale; it does not get much warmer than this, so people say, “This is it! This is the warmest we are getting so we might as well make the most of it!” Whereas in the US, these temperatures feel cool, and we know that we will get warmer days, so we still bundle up and hold out for the really nice weather! Also, I was told this many times before coming here, and after only one week I see that it is in fact true… because there is minimal humidity, it never feels as cold as the thermometer says it is. So I was very comfortable sitting outside in the 55*F weather, whereas in the US someone would look at you like you are crazy if you did that! After a wine and cheese session, we cooked dinner. Roar made a delicious fish soup and we prepared burgers, and then we had a delicious feast! It was great to talk to Roar about life in Greenland, history, etc. He is from the Faroe Islands, which is also a Danish Protectorate (I am not sure if they have a home rule like Greenland does), so it was interesting to compare the Danish perspective I get from Pia & Ulrik and coworkers to his Faroese perspective to Sharon’s and my American perspective, to the Greenlandic perspective we see a little bit at work. First things first, we had to get gas before doing anything! There is a boat gas station in the harbor – functions just like a car gas station! Pull your boat up, tie it up, fuel it from the pump, and go pay inside 🙂 Then we were off! We had two choices of where to go. We could either go north toward the Davis Strait, or we could go south into the fjords. Ulrik decided to go south because it was broadcast earlier that morning that there was a polar bear just across the water from Nuuk! We later came to find out that tons of people rode out to where the polar bear was napping high atop the rocks. Evidently he was fairly uninterested in all the water traffic below him! From the harbor we headed south until we were out past the peninsula on which Nuuk and Qinngorput lie; I guess peninsula is the correct word. All of the Greenland coast is made up of fjord systems, so the land comes out like craggly fingers. After we cleared the land and were on the backside of Store Malene/Ukkusissat (the mountain that dwarfs us in Qinngorput) we turned and headed northeast into Kobbefjord. On the map, the fjord appears to cut in maybe 30-40 miles, but we only went halfway and it took us about 30 minutes. Even though it was 16*C or warmer (approximately 60*F) on land, it was pretty chilly on the water because of the speed of the boat. It was interesting, though, that once we got a little ways into the fjord and were shielded from the open water winds, the air temperature was noticeably warmer! It was like we hit a wall when we crossed that point! We met up with Pia & Ulrik’s friends, Hans and Katrine, whom I met last weekend when they were over for drinks. They were cod-fishing so we stopped with them and threw our lines out a time or two. We did not use fishing poles; instead we used this plastic handle thing and just manually unwound and wound the fishing line around it. No bites, though! We concluded the boat trip by pulling into shore, anchoring, and climbing a little ways up the grassy hill to get a good look out over Kobbefjord, pictured below. Hans’ and Katrine’s boat anchored as well, so I had the chance to meet their friend, an American named Doug, who had moved to Nuuk a few months ago! Although he is American by birth, he has lived in Denmark for a couple decades, so I did not consider him in the same boat as me! No pun intended. But he was nice to talk to! We stayed about twenty minutes or so, enough time to have a Faxe Kondi (a soda that is like Mountain Dew) and some cookies, and then we were off again. We got back home around 18.30 which was perfect timing to meet Sharon in Nussuaq (where she lives) so that we could walk around the City Center and get our bearings a little better. I should mention that while I live in Qinngorput, Sharon lives in Nussuaq, and we work in City Center, these are not different towns or zip codes. It is all the capital city of Nuuk. The whole inhabited area cannot be more than a three mile radius! Saying “Qinngorput” and “Nussuaq” is more like saying the name of an apartment complex or housing development. 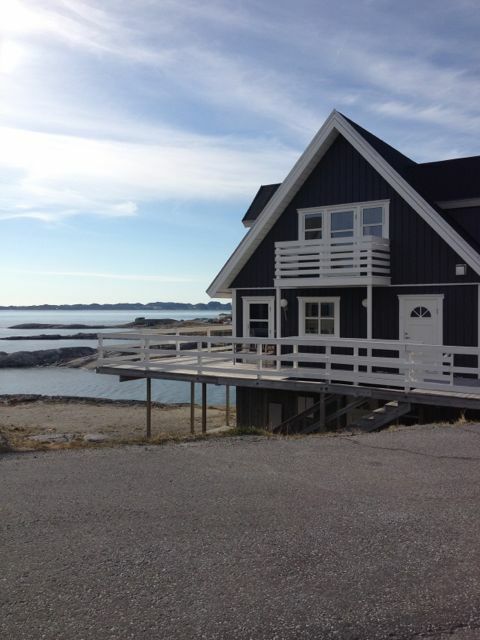 Sharon and I walked around the southwest part of Nuuk. There is a road over there, I think it is Nuukullak, which is called the “Beverly Hills” of Nuuk because the houses are very large single family homes, pictured below.. (As opposed to the majority of housing in Nuuk which is either small homes, long low apartment buildings, or tall skinny apartment buildings There are also the Bloks right in the center of town, which I am sad to say look more like tenements than anything else. There are plans in the works, though, to refurbish them and, for some, even reconstruct them.) But back to Beverly Hills – these houses are not just large for Nuuk standards; they would be large in the US, as well! But they were constructed very similarly to how beach houses in the Outer Banks, for example, are constructed. From “Beverly Hills” we went down to the rocky shore and sat for a bit, collected sea glass, and then checked out some centuries-old Moravian Monk ruins right along the water, pictured below. Right now they only look like grassy/straw-covered mounds that stand about 2′ high, but there is some of the original rock wall and entrance way exposed which is very cool! These homes are tiny… MAYBE 50 square feet! I am assuming they were used for sleeping and not much else – I cannot imagine how there was room for any other activity! We finished the evening by stopping into barista, a cute little coffee shop/cafe that I had been to once before. We both got chicken (kylling) paninis and smoothies! All in all, it was a great day! I was so happy to have the chance to go out on Pia & Ulrik’s boat, and I feel like I have a good mental map of Nuuk now! This afternoon after work, Sharon and I went to see a movie called INUK. It has won a slew of film awards and was featured at Cannes, Woodstock Film Festival, and the like. My host family tells me it has also been nominated for an Oscar in July! Our first movie experience in Greenland was very fun! The cinema is located on Kuussuaq (the road) in Katuaq, the Culture Houe/Kulturikkut Pikialaartitsisoq, and is very nice. It also doubles as the playhouse for live performances, and there is a full-service cafe inside Katuaq, as well. When we bought our tickets, we actually chose the exact seats we would sit in using a touch screen computer! Then we went through the concessions line which is a very small room with wall to wall bulk candy bins, beverage fridges, and popcorn machines with a table in the center that houses an ice cream freezer! The movie ticket prices here are pretty high, but the concessions are very cheap, so it basically evens out to be the same price as the US. This movie was definitely a conversation piece, mostly because it depicted the city in which we live, so people inherently had opinions about it. The consensus seemed to be that Greenlanders really liked the movie, but that Danes were less favoring of it, although there are of course exceptions to everything! One Greenlander said she did not like the movie because it was translated incorrectly from Greenlandic to English and also because it depicted Greenlanders as victims and Nuuk as a bad city and she did not like that at all. It was actually quite timely to see this movie today because my boss, Anders, and I had just had a great conversation about small languages in Greenland and how their survival has basically depended on the lack of ground infrastructure in the country. The official language is West Greenlandic (called Kalaallisut) and has the most speakers, but two other languages also exist – East Greenlandic (called Tunumiisut) and Inuktun (called Avanersuarmiutut) spoken in the North – that have only a few thousand speakers! These languages surely would have died out long ago if roads existed between the settlements because North and East Greenlanders would have had to conduct business and education in West Greenlandic, causing their languages to become increasingly obsolete. I asked Anders if Greenlanders want roads that connect the settlements. He said that yes, some do, but in the end, it always comes down to price. The expense of building roads is so great that it would take hundreds of years to see a return on the investment – clearly this is not an advantageous scenario. Even though Greenlanders have to sail or fly any time they want to leave a settlement, this remains to be the more economic choice because it is possible to fill these transportation machines to capacity. With such low population density, use of the inter-settlement roads could never reach the capacity necessary to make them financially valid. Greenland is such a fascinating and unique case, and everything about it is intertwined with the climate. I wish that I could know the future to see if these climate change predictions actually pan out and what effects they have on Greenland. There is a bookstore here called Atuagkat (Anders was teaching me some basic word order, and I think the root is Atuar- meaning “to read”) that is supposed to carry a lot of non-fiction about Greenland. I am told that it is moving so right now there are big discounts on its inventory. I want to check it out to see if there are any good books on Greenlandic language, culture, or public opinion.